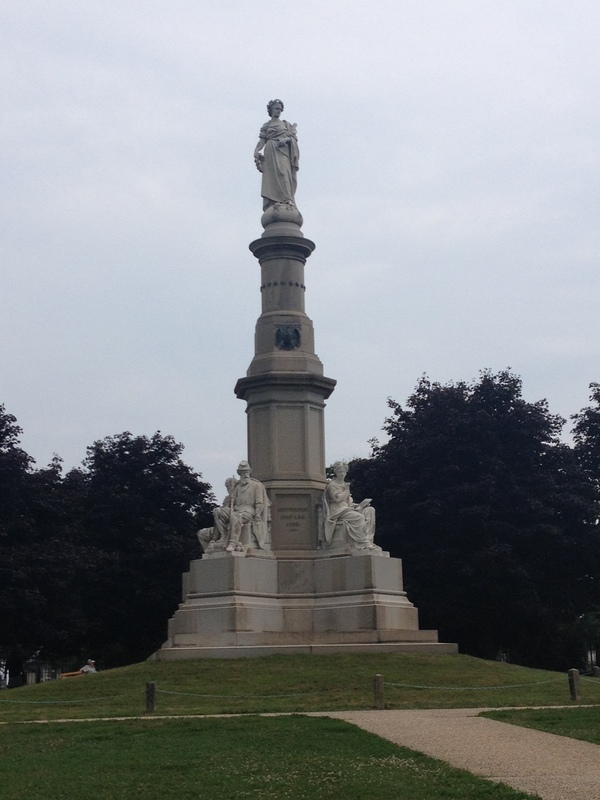 This past Sunday, I was able to take the trip North to visit Gettysburg. I’ve been interested in the Civil War since my love of President Lincoln was kindled in 2009 so a trip to the most famous battlefield was a mandatory pilgrimage. Upon arriving, we by passed the introductory film but for those who are unfamiliar with those three bloody days in July, it’s probably worth shelling out the $12.50. (You also get admission to the museum and cyclorama of Pickett’s Charge) There are also options for bus and private tours of the nearly 6,000 National Park, but we opted for the free self-guided auto tour. You can pick up an auto tour map in the Visitor’s Center that provides information of the events that happened along the route. 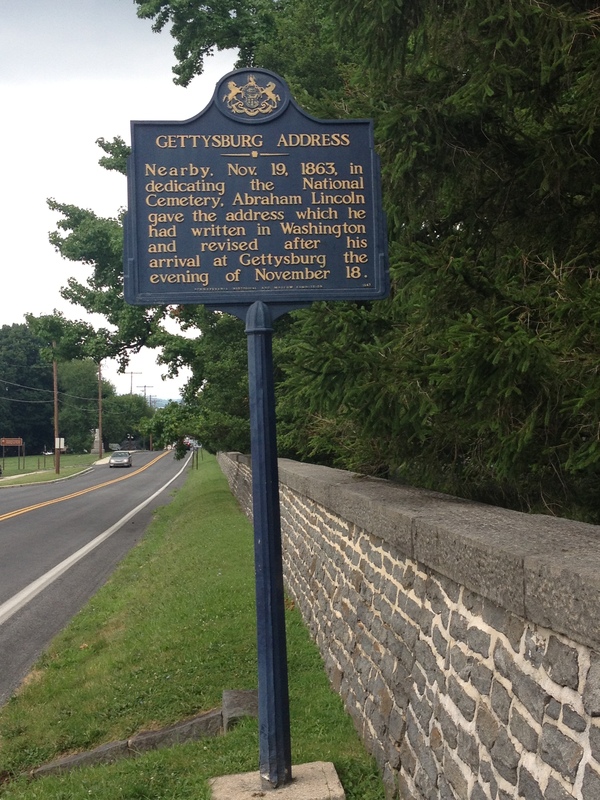 The auto tour starts at McPherson Ridge, to the northwest of the town of Gettysburg, where the battle began on July 1, 1863 at 8am when Union cavalry confronted Confederate infantry. Continuing on, is the Eternal Light Peace Memorial, where at 1 pm on July 1, the Confederates fought back at the Union soldiers on McPherson and Oak Ridge. On the 75th anniversary of the battle, Civil War veterans dedicated this memorial with President Franklin Roosevelt. Panorama of Oak Ridge, where Union soldiers fought Confederates until 3pm, when they were forced to retreat. 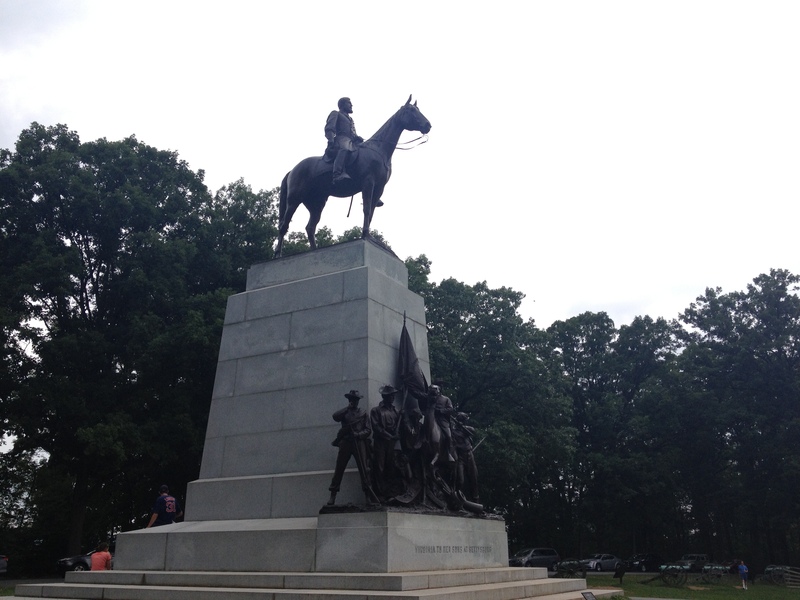 Our next stop was the Virginia Memorial, which was also the location of Pickett’s Charge on July 3. The memorial is located to the east of Spangler Woods with General Robert E. Lee and his favorite horse, Traveler, looking out across the field of Pickett’s Charge. There’s a short path that leads down to the location of Pickett’s Charge, but it’s easy to miss if you’re not looking for it. 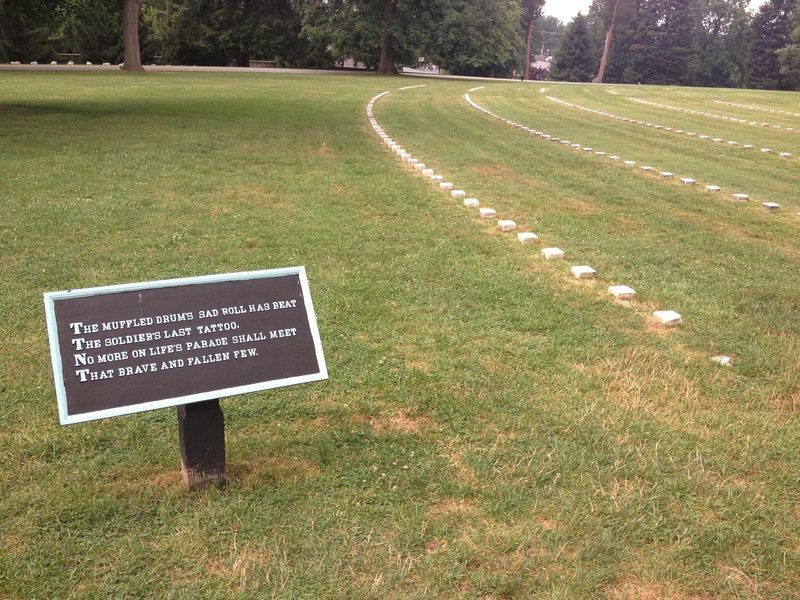 Pickett’s Charge was a devastating blow to Confederate forces, with over 50% of the men in grey killed in action. The reason for the huge Confederate loss was due to an oversight; Emmitsburg Road, which ran between the Confederate and Union lines, dipped into a valley and was bordered by a fence. Basic wartime tactic: you never want to be below your enemy. 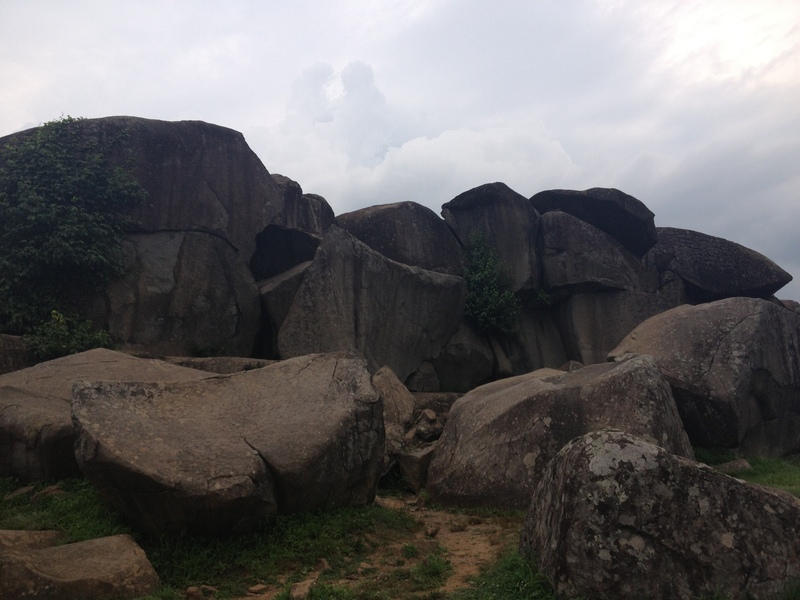 Another major battle location was Little Round Top, and subsequently Devil’s Den. On July 2, Union forces successfully defeated Confederates who were firing from the nearby Devil’s Den. Though the Confederates were guarded by the natural protection of the boulders of the den, they were still firing at an enemy that was situated higher above them. 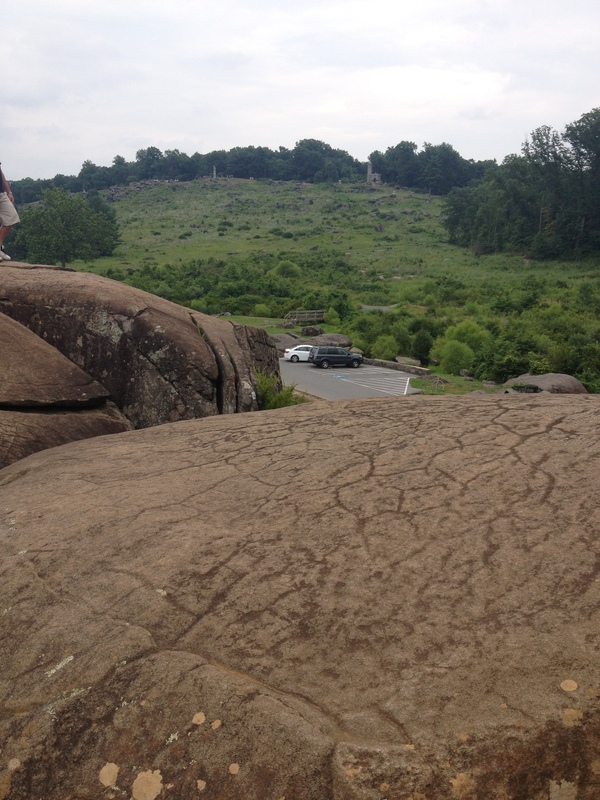 Little Round Top provided sweeping views of large sections of the battlefield, making the location incredibly desirable. Panorama of Little Round Top. The Devil’s Den can be seen to the rear left. Gettysburg is ranked #3 on “most haunted places in America” and the Devil’s Den is perhaps the most haunted place within the battlefield. The location is where Confederate snipers hid to fire at Union forces located on Little Round Top History remembers this location from the infamous picture of the Confederate sharpshooter taken by photographers Alexander Gardner and Timothy O’Sullivan. There are numerous reports of camera batteries suddenly draining at the location of the photo of the sharpshooter and capturing images that weren’t there, or capturing nothing at all. On our trip, we saw nothing out of the ordinary, though rumor has it the solider haunts the area because the photographers moved his body from it’s original location to stage the photograph. On top of Devil’s Den. You can see Little Round Top ahead. 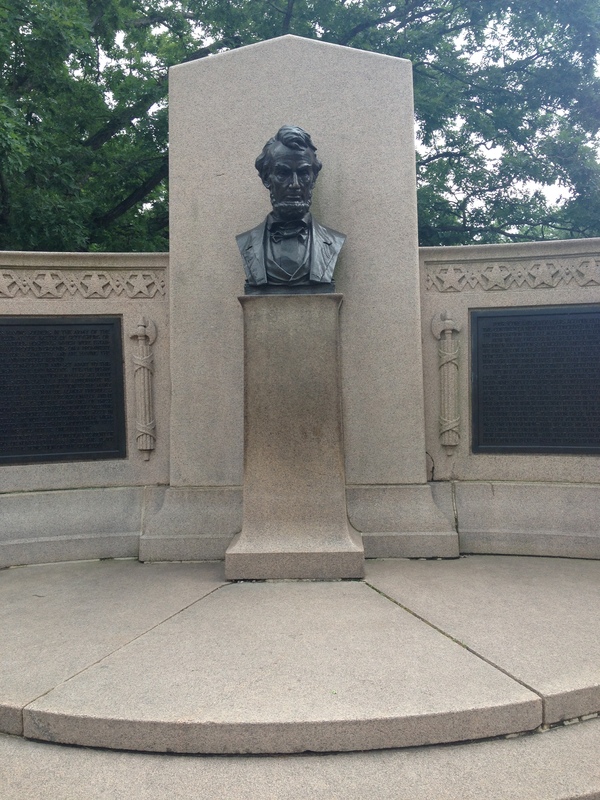 And of course, there’s Abraham Lincoln. On November 19, 1863, President Lincoln visited Gettysburg to dedicate the Soldiers’ National Cemetery and delivered his famous Gettysburg Address. Though I’m a big fan of Lincoln, I didn’t know too many details about the battle. Being submerged in the actual location is perhaps one of the best ways to learn; seeing the same sights soldiers saw 150 years ago is quite surreal and humbling. It’s impossible not to think of the thousands of lives who fought and how their loss completely changed our history. 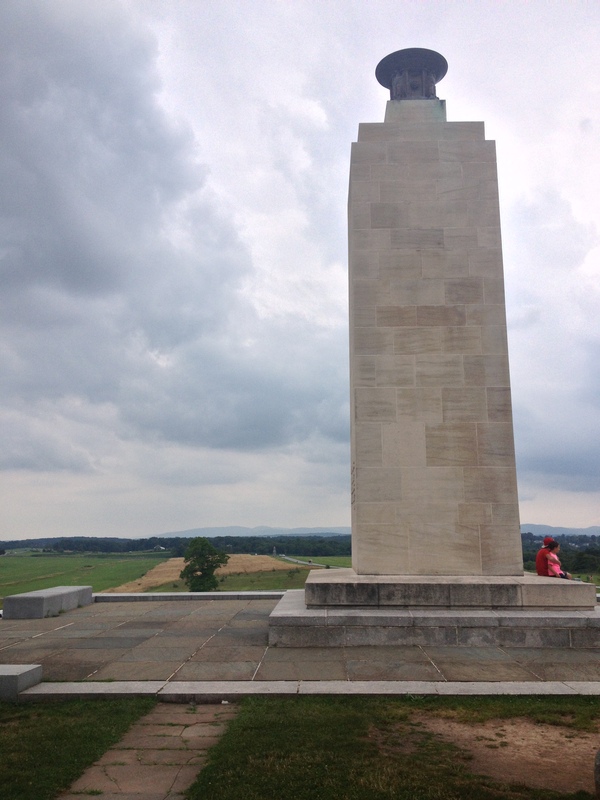 Plan plenty of time when visiting Gettysburg. We didn’t arrive at Gettysburg until about noon and didn’t finish our tour until about 4pm. 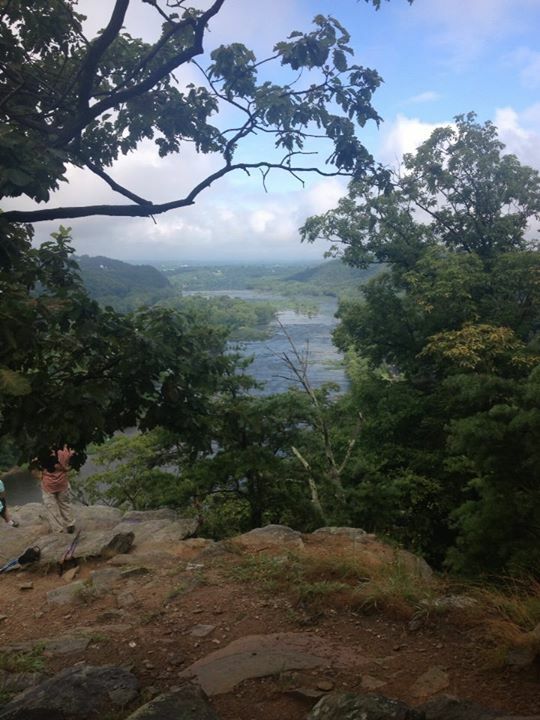 The park also offers hiking and bridle trails, if you prefer a more authentic experience. It’s hot in the summer. I’m not sure what it is about historic areas, but they seem to be about 10 degrees hotter than any surrounding area. Dress accordingly. It might be helpful if you brush up on some Civil War history. Unless you enjoy learning through submersion, which is cool too! It’s practically free (unless you choose the add-ons) and you have literally no excuse to pay this important historic park a visit! 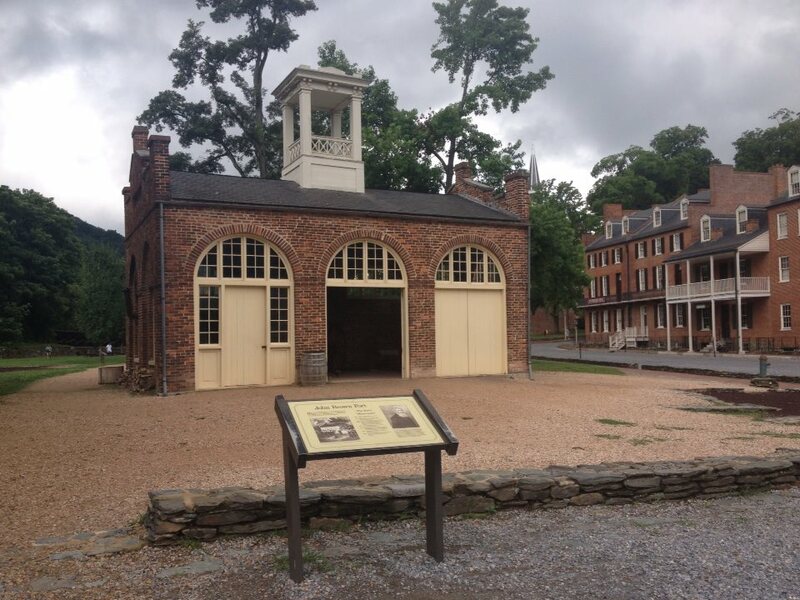 This weekend, I took a drive with some old friends and visited Harpers Ferry, WV. Known for it’s rich Civil War history (John Brown’s raid, anyone? ), this pretty little town–a population of only 285–is perfect for a hike and a history lesson. 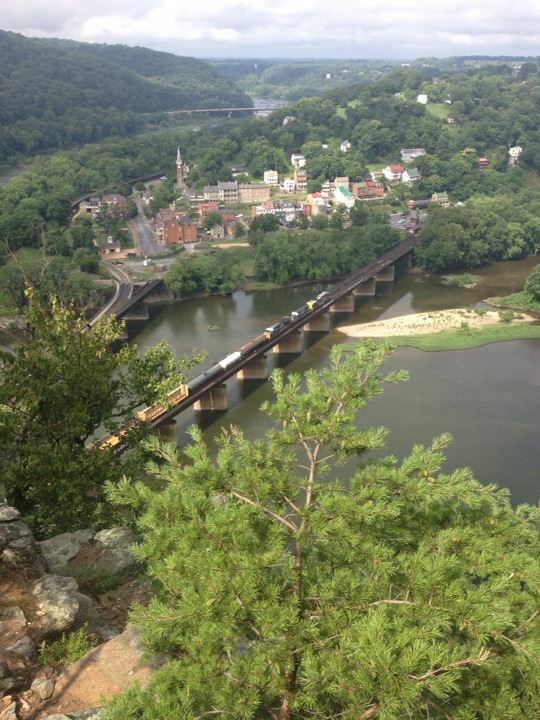 We started our day trekking up the most popular trail, Maryland Heights. 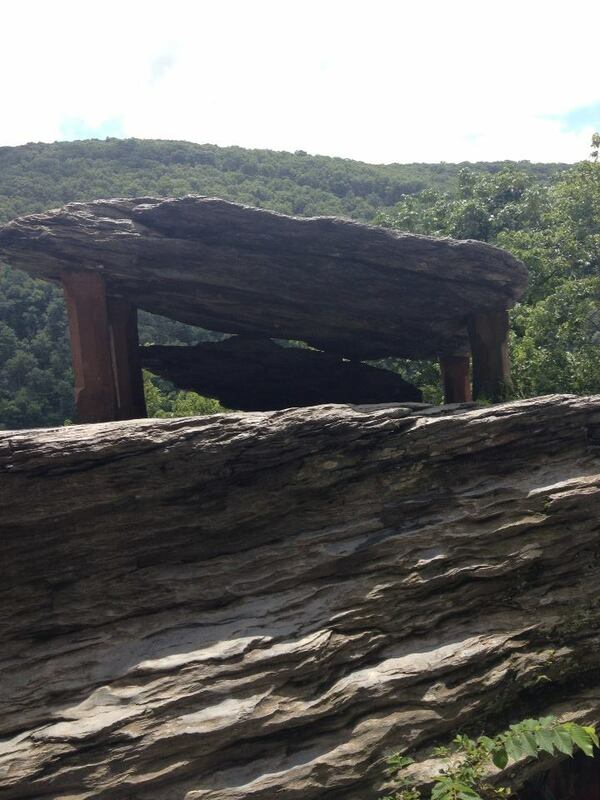 Topping at 1,600 feet, Maryland Heights features picturesque views from the Blue Ridge mountain range. We passed the Naval Battery, which protected Harpers Ferry from Stonewall Jackson’s Valley Campaign in 1862. At the top of the mountain is the Overlook, where most of the pictures of the day were taken. A train came through the mountain while we were exploring! 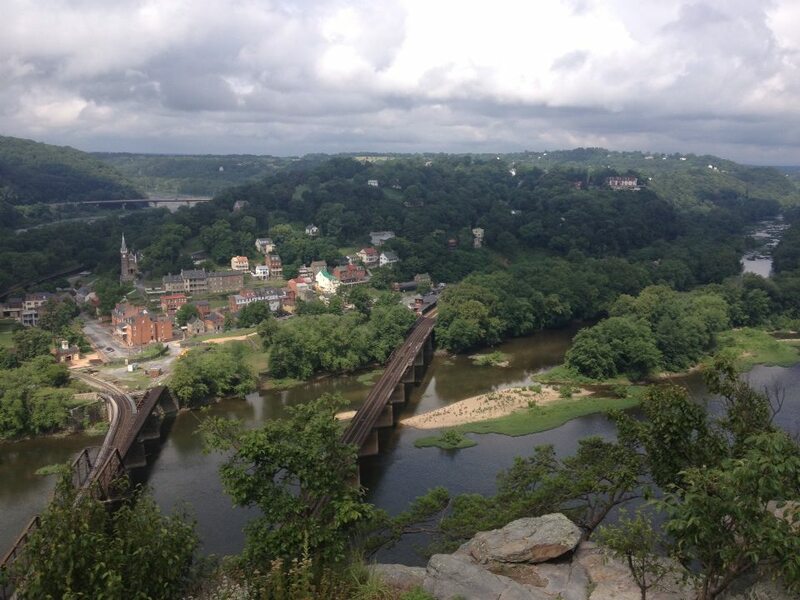 From this height, you can see where the Potomac and Shenandoah Rivers combine, making the cusp of the town of Harpers Ferry. If hiking isn’t your ideal of fun on a humid summer day, there are a variety of tubing and kayaking tours that take you down the Potomac River. After the hike, we made our way back down the mountain to explore the town. The main focus of downtown is the history of John Brown, the abolitionist who attempted to start an armed slave revolt by appropriating a national arsenal in town. The “fort” John Brown and his men barricaded themselves inside after they failed to retain the arsenal. While some buildings are open and functioning as restaurants, shops, and inns, most are used as self-guided museums, allowing visitors to learn and visit at their own pace. There are several exhibits throughout town, devoted to Storer College, the water conservatory, John Brown, Meriwether Lewis, and Civil War history. I was especially excited to see that Thomas Jefferson was a presence here, having visited briefly in 1783 while traveling to Philadelphia with his daughter, Patsy. Jefferson stood on a rock, which still stands today, and commented on the view that he saw in his only published book, Notes on the State of Virginia. Full quote can be found here. 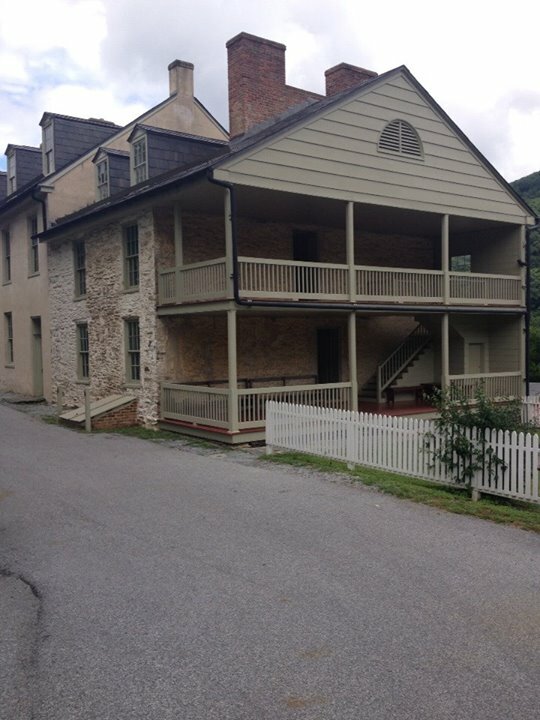 Harper House, where the Jeffersons stayed while in Harpers Ferry. 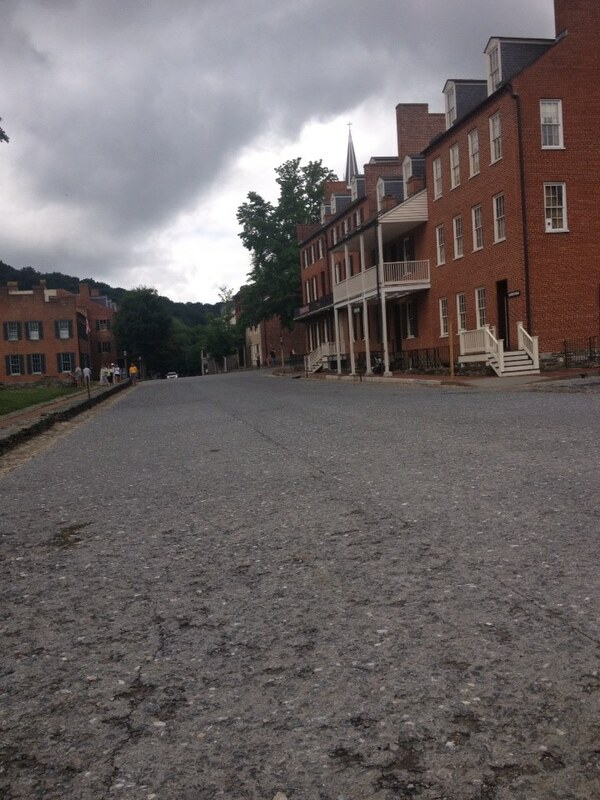 But another story from Harpers Ferry that’s lurking around every corner are the ghost stories. It seems that every soul that has stayed here has found it impossible to leave, from the likes of John Brown to John Wilkes Booth. The Harpers Ferry Ghost Tour has been rated #1 Ghost Tour on Trip Advisor, and they run every day at 8:00pm. A selection of ghost stories from the area can be read here. There’s no doubt the town is spooky, half the buildings look abandoned and there seems to be a permanent mist hugging the mountains, but we saw no paranormal activity on this trip. 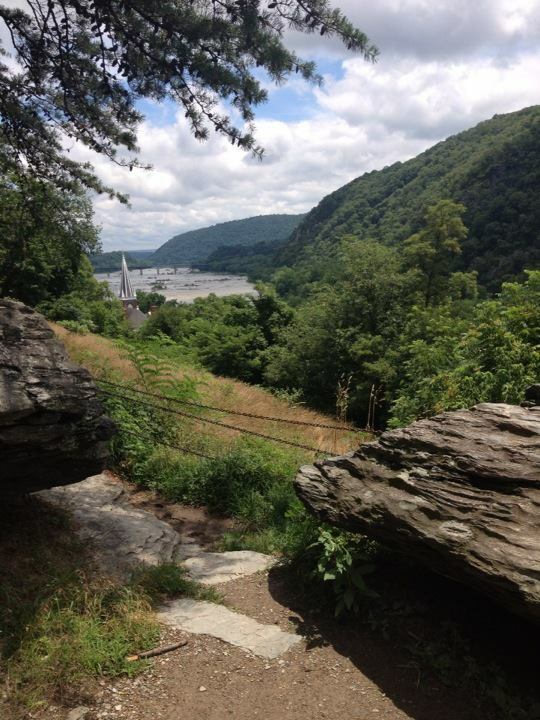 Harpers Ferry is the perfect day-trip for those interested in hiking, history, or just looking to be transported back in time for a few hours. Though a lost cost trip–parking is $10, but everything else, excluding meals and souvenirs, are free, you’ll leave with far more than the chill down your spine. If you’re a fan of Thomas Jefferson or just American History in general, put Monticello on your next-to-visit list. The gorgeous plantation was built on top of a 850 foot high mountain in Charlottesville, Virginia, about an hour outside Richmond, starting in 1769. It wasn’t finished until 1809, though Jefferson continued to work on it until his death in 1826. I was lucky enough to visit Monticello this past Saturday and was completely in awe of this amazing home. Jefferson went to William and Mary to study natural philosophy, but in his downtime he learned law, languages, and architecture. And yes, Monticello’s design came out of the brain of a man who was untrained but not uneducated. 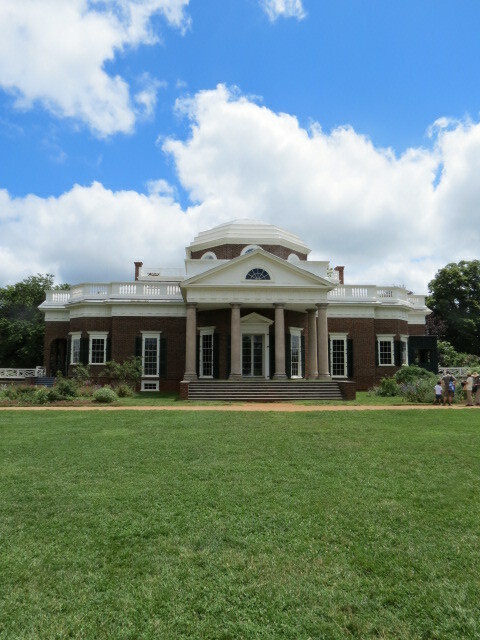 Jefferson was obsessed with architecture and Monticello (which is Italian for ‘little mountain’) was heavily influenced by neoclassical design. The house itself is a sight to behold, a beautiful 43 room structure, but the grounds are equally as magnificent. 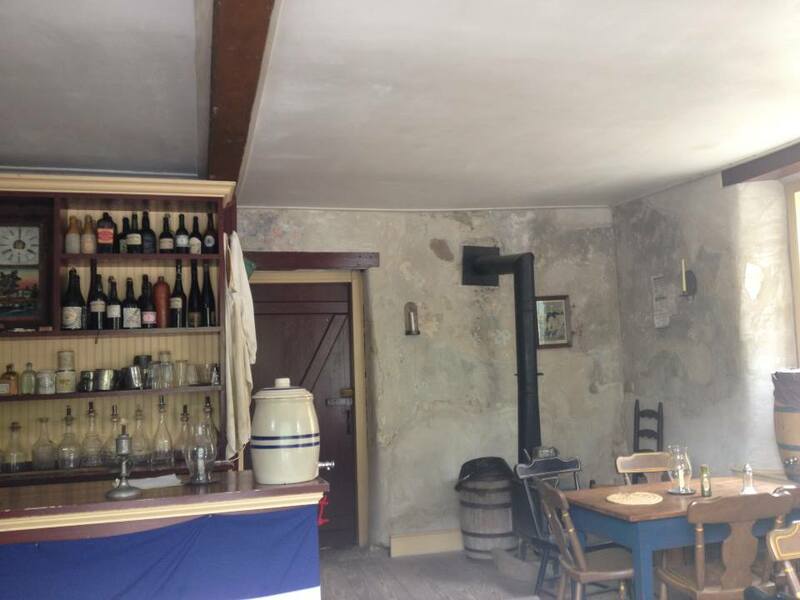 Unlike any other plantations, Jefferson built long L-shaped terraces jutting from each wing and placed the necessary servant rooms (kitchen, smokehouse, wine and beer cellars, etc.) 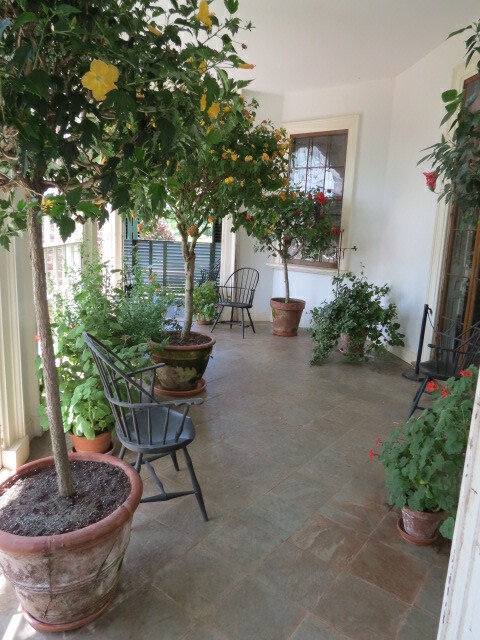 underneath each terrace. Jefferson first moved to Monticello in 1770. 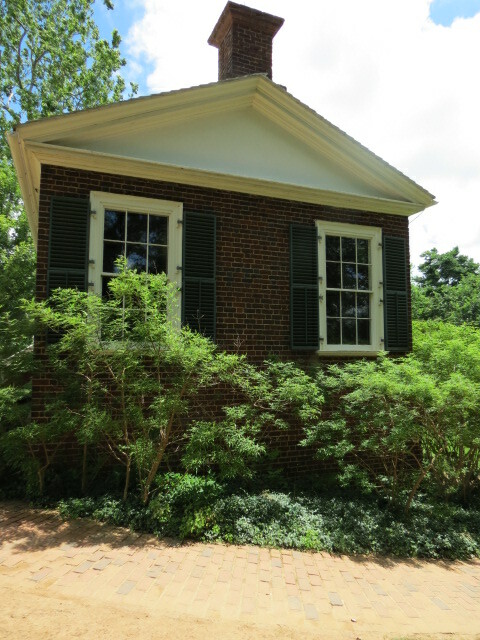 The house was far from being completed and Jefferson lived in a one room building, called the South Pavilion. When Jefferson married Martha Wayles Skelton in 1772, he brought his new bride to Monticello’s South Pavilion. Their first child, Patsy, was born there in late 1772. After Martha died, Jefferson left for France in 1984 as America’s Ambassador. 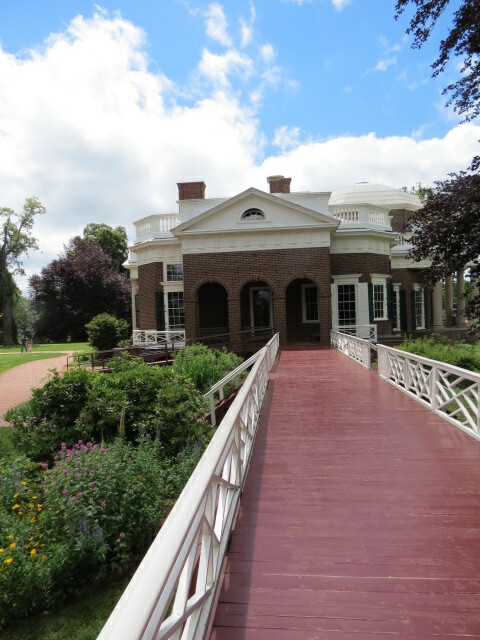 While living abroad, Jefferson fell in love with European architecture and rebuilt Monticello to fit this new obsession. 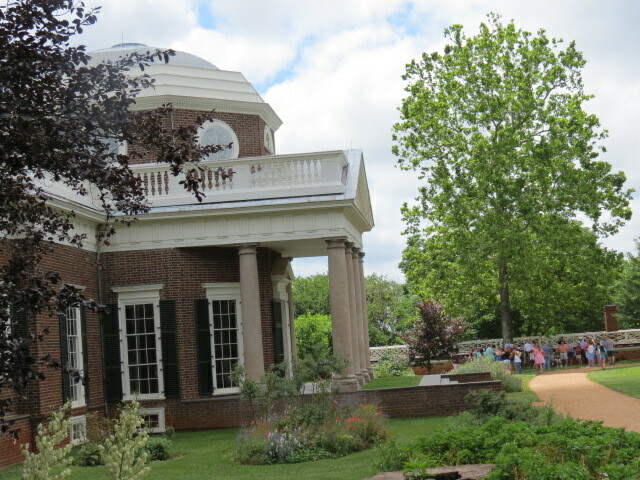 Monticello’s most noticeable addition was a dome that capped the top floor. A beautiful apartment, the dome was rarely used because it was hot in the summer and cold in the winter. 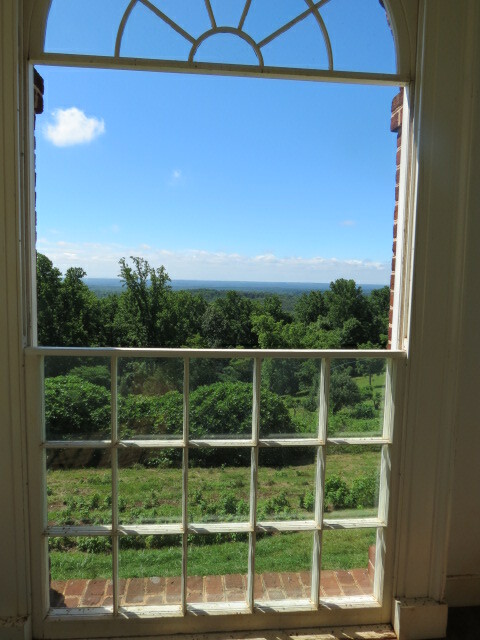 Inside, Monticello boasts thirteen skylights (the first house in America to do so), 18 foot high ceilings in various rooms, eight fireplaces, and a dumbwaiter which brought wine from the cellar to the parlor, to name a few attributes. Today, about 1/3 of the glass in the houses windows and doors is original. Jefferson’s greenhouse off his private wing. 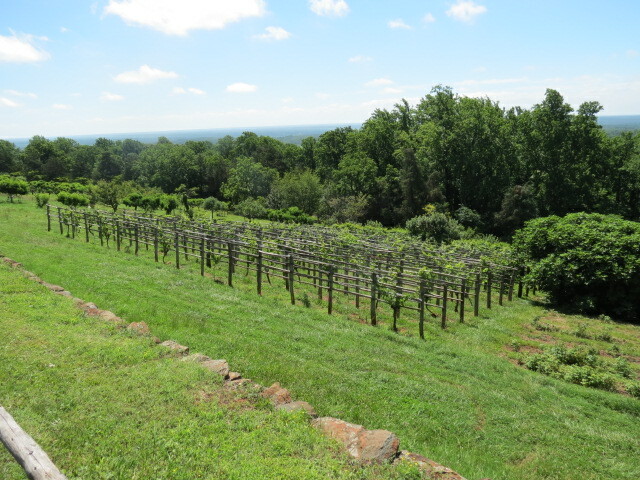 Monticello started its life as a tobacco plantation, but due to the damaging effects of the plants on the soil, Jefferson later switched to wheat. He also grew over 300 different types of vegetables, various herbs, and ran an orchard and a vineyard. 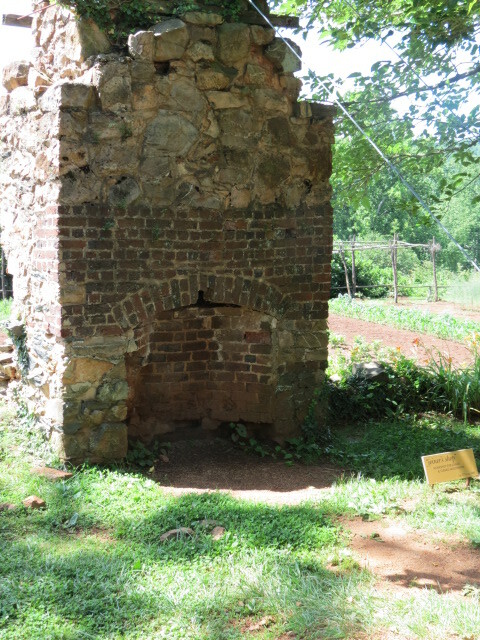 Monticello was also home to at least 200 slaves during Jefferson’s life. They lived on Mullberry Row, named for the Mullberry trees planted along the path. More than 20 structures were built along this small stretch of land. Unfortunately, all that stands today are stone foundations and the fireplace from the joiner’s shop. 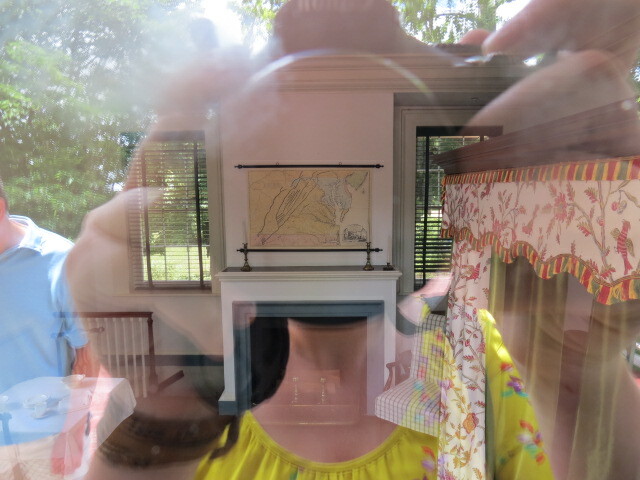 Jefferson died in his bedroom at Monticello on July 4, 1826. He had been slipping in and out of consciousness for days and it’s believed he held on only to die on the 50th anniversary of our country’s independence. 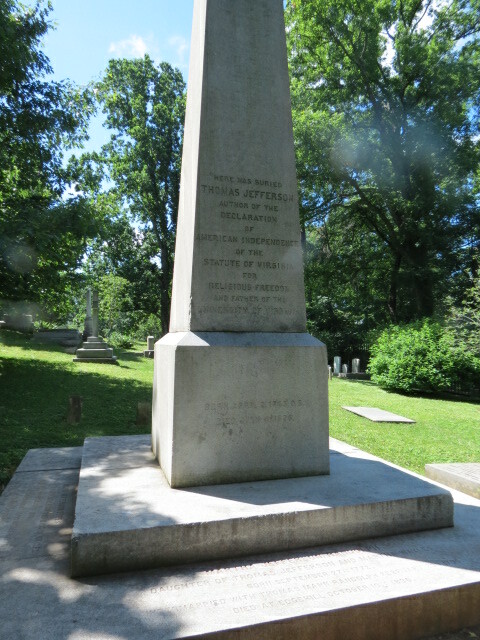 Jefferson requested to be buried at Monticello and even wrote his own epitaph. He is buried alongside his children and wife. 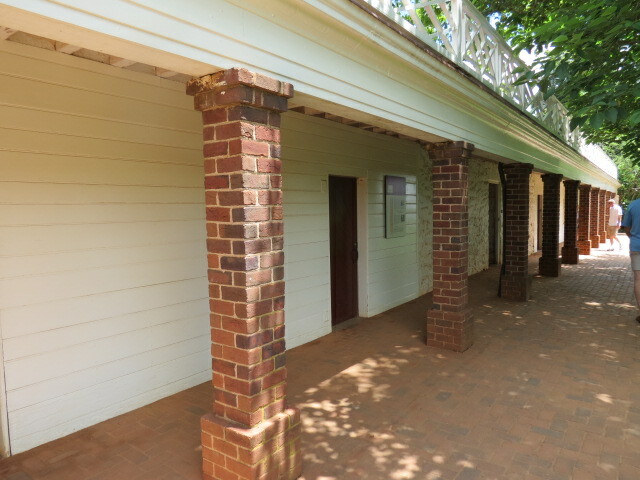 Jefferson’s presence is felt throughout the house and the grounds, whether or not that presence is actually him or not is up to the visitor to decide. In a few pictures I took, though it was a clear and beautiful day out, orbs and hazy blobs show up in the photographs. Could it be Jefferson himself coming back to check on the house he loved so dearly? 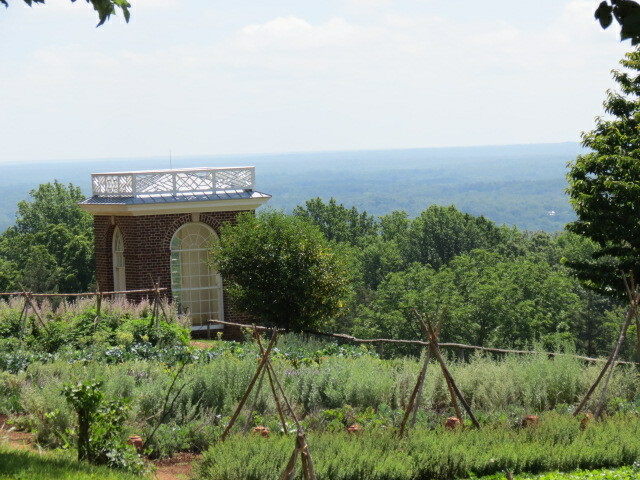 Take a visit to Monticello and decide for yourself!